It is a general-purpose product line, which is designed for most of users. Equipped with most of the basic hardware interfaces (I/O, UART, I2C, SPI, ADC, TIMER/COUNTER, RTC), PHPoC IoT Board is able to interact with all kinds of sensors or actuators. Especially, a variety of expansion boards are designed to add more advanced capabilities (such as relay, DC motor, step motor controllers, etc.) 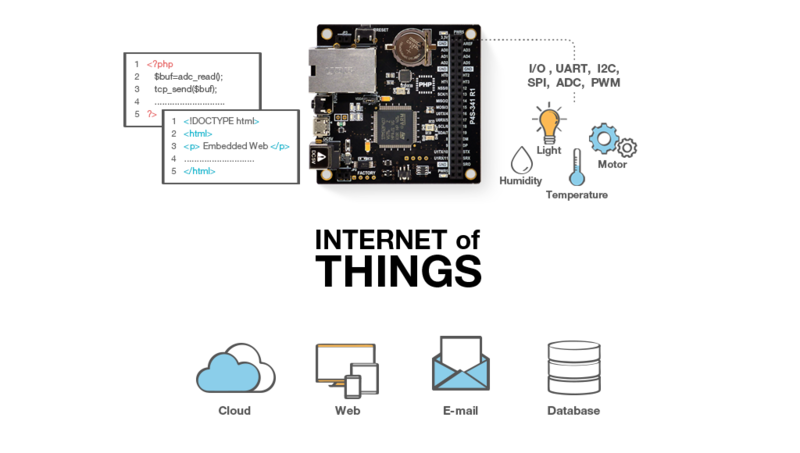 to PHPoC IoT Board and bring more conveniences, flexibility and extendibility to users. PHPoC IoT Board has most of basic hardware interfaces (I/O, UART, I2C, SPI, ADC, TIMER or COUNTER, RTC), which are used to interact with sensors or actuators. PHPoC IoT Board has both Ethernet and Wi-Fi connectivities. It supports various network protocols (IPv4/IPv6, TCP/UDP, ICMP, DHCP, HTTP, SSH, SMTP, ESMTP, DNS, DDNS, MySQL ...), security protocols (WPA-PSK / WPA2-PSK, WPA-Enterprise(TLS/TTLS/PEAP), SSL/TLS) and encryption algorithms (AES, SEED, RC4, 3DES). Equipped with the Web server and WebSocket server, PHPoC IoT Board enables users to develop the real-time embedded Web application. It is integrated with PHPoC interpreter, making it easy for users to interact with peripherals and create the dynamic embedded Web App. Expansion boards are designed to provide the additional hardware and firmware for advanced capabilities (such as controlling/monitoring high-voltage devices, DC motors, step motors controllers ...), and create the firm connection to other devices. Expansion boards are stackable on PHPoC IoT Board. Expansion boards are categorized into PHPoC Expansion Board and PHPoC Smart Expansion Board. This kind of boards can be stacked on PHPoC IoT board, providing the additional hardware such as Breadboard, RS232, RS422, RS485 and so on, and standardized connectors and sockets such as Grove interface, mikroBUS™ socket, pitch terminal block and so on. Pinouts of expansion board connect directly to pins of PHPoC IoT Board. Therefore, by using expansion board, PHPoC IoT Board can interact directly with sensors/actuators. This kind of boards can be stacked on PHPoC IoT board, providing not only the additional hardware but also firmware (for advanced capabilities such as controlling DC motor, step motor...). Operation of Smart Expansion Board is controlled by PHPoC IoT board via a definite set of commands, through a specific port. Smart Expansion Board can be specified by a slave ID number among 14 different ID numbers available that you can set by a DIP switch. These boards help save costs and make flexible and expandable during development. Who can use PHPoC IoT Board?